Here at SG HQ, we will beat the denim jacket drum ’til the day we all die. Not too heavy, but still sturdy, this outerwear essential (yes, essential!) easily transitions from cool summer nights with a tee to late November bonfires with a flannel or sweatshirt. You can even wear it under a heavier coat in winter. If you’re still not on-board, maybe after today you will be. SG Says: You can fit more under a sport coat than you think. Go with a textured, more burly number, like the herringbone above to keep the vibe unfussy. SG Says: Yes, you can dress a denim jacket up. Try yours with a trench or mac coat, button-front shirt and dress pants. Think you can pull off the hat? Go for it. SG Says: What’s that? You’ve seen this picture before? Damn right you have. SG Madness 2018 winner (and MY pick to go all the way) Ryan Gosling wore it while promoting Blade Runner One Million and Two (or something like that) last year. Lucky for guys fashion doesn’t change all that quickly, because it looks just as good this cold weather season. SG Says: Yes, really. With moto denim (which you can totally pull off! ), white sneakers, and black on black tees, a sherpa trucker jacket is the perfect fall weekend look. Nose ring optional. SG Says: Don’t be afraid to wear your denim jacket more like a shacket, buttoning it up and keeping it that way. For this, you’ll want a jacket with a bit more structure. Also, remember the darker the wash, the more formal your denim jacket will look. So choose accordingly. Want even more specific outfit ideas to wear with a denim jacket? You got it. You guys know team SG will endlessly root for light layers. And the denim jacket is the lightweight layer to end all layers. No matter how little thought you actually put into your outfit, a denim jacket on top is always going to feel like you at least tried. And why is that? The structured shape is universally flattering, and the style is a timeless classic that looks just as good at 3 and 93. It goes with literally everything. While the looks above are great for inspiration, you might be saying, “But Gabi, I’m not a style blogger or international celebrity (yet!). Can I wear a denim jacket to work? To the bar with my buddies? Help! And I hear you. So I pulled together some really specific outfit ideas to help you know what to wear with a denim jacket, and to where. SG Says: I hear from guys that they don’t know what pants to wear with a denim jacket, which I suspect is because so many guys are overly reliant on jeans in their wardrobe (shout out No Jeans January!). So here you go. Chinos (and their closet cousin, the twill pant) are the perfect solution. 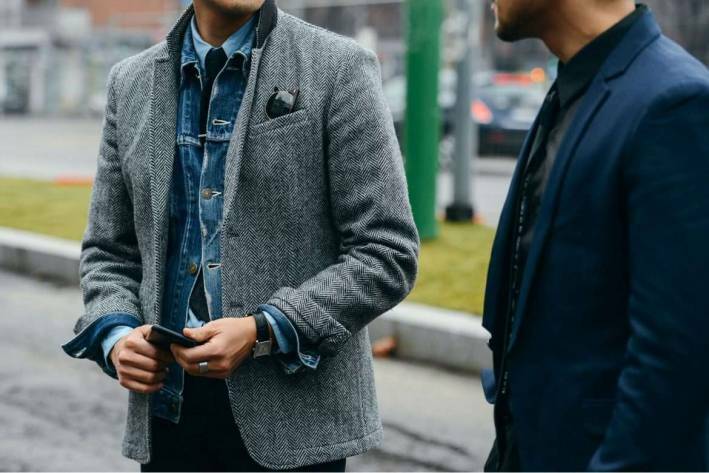 Put the casual in “business casual” with a denim jacket under your blazer. SG Says: Dress down your dress pants and topcoat with a striped tee, denim jacket and Chelsea boots underneath. SG Says: A denim jacket steps up your standard errand running outfit. 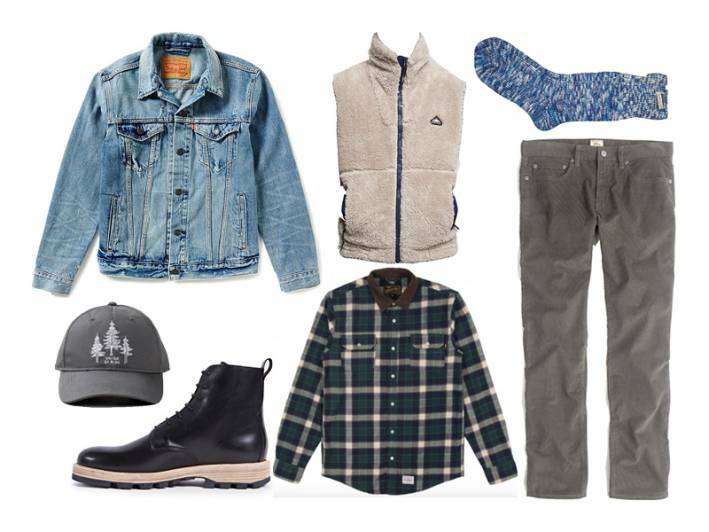 SG Says: Layer your denim jacket between a flannel and vest for your next jaunt through the woods. SG Says: The secret to pulling on the Canadian tux with panache? Differing your shades of denim. Not sure which is the best denim jacket for you? If you’re ready to invest in some new clothes (like a versatile denim jacket! Yes? Yes!) but dread the thought of shopping…consider having Team SG shop for you! We’re obviously biased, but we swear it’s really great.